The Ambient Music of Kit Watkins is quietly magnificent. Simultaneously representational and abstract, his aural meditations have a way of expressing what the listener is already feeling. 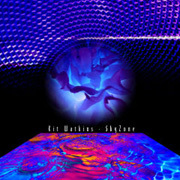 The CD SkyZone (71'12") is comprised of 12 earnest sky-sized tone poems. While the moods this work produces are serene, the music is far from simple. One may hear the sophisticated echoes of Watkins' Prog-Rock heritage in the subliminally advanced arrangements, which benefit from his talent for song construction. But the power of his music is in its truthful feel. Throughout the disc Watkins is sonically evocative as entangled harmonic clouds counterpoint morphing dissonant drones, reverberant melodies drift through the soundfield as if caught in a breezy dance, and gentle thought tones reiterate in respiring variations. The hope of this album is to move us to a place of transcendence. Hearing the luminescent beauty of SkyZone, we get the sense that Watkins is playing for his own spiritual good as well.